Last Friday 31 August a few committed people set up the Ministry of Men’s Affairs on parliament grounds after protesting near the Family Court, because successive governments have failed to address men’s issues or to seek true gender equality. We set up a good public address system, gave speeches, sang songs and tried to make the issues clear. TV3 attended and did extensive filming and interviewing. However, the article was never screened because so few attended and it was deemed to be a non-event. I guess men deserve what they get from our government. Men will deserve the new Family Court as is proposed by Judith Collins who plans to tinker with it simply to save money. Men will deserve the huge increase in false allegations that will almost certainly result because such allegations will be the only way to get free attention from the Family Court; absolutely zilch is proposed to deter false accusers or to prosecute them more often for perjury. Men will deserve the ongoing favourtism towards women because Ms Collins has in no way recognized the Court’s sexism or proposed any restriction on it. Men will deserve the longer prison sentences they will receive when they breach unnecessary protection orders by attempting to express their love for their children in any way, because Ms Collins proposes nothing to reduce the use of protection orders or their inherent foolishness, injustice and child abuse. Men will deserve ongoing exploitation from the Family Court as it continues to order spousal maintenance to keep the women who abandoned them in the style they have grown accustomed to. Men will deserve the Family Court’s ongoing rubber stamping of CYFS child abductions, removal of children by mothers far away from fathers, and vicious so-called ‘child support’ regimes set by Administrative Review officers. Never mind, we did it and that’s all we can say. We can only be responsible for what we do, not for what others do or don’t do. We also announced the Black Ribbon Campaign. We plan to run it every spring for three months up to the date of White Ribbon Day. “Show you care about men” is the motto because men need caring more than ever before in our lifetimes. We thank a number of people for very generous donations to the campaign and we invite others to donate $5 or more, whereupon if they provide us with a mailing address we will send a ribbon and pamphlet outlining men’s need for caring. I am working on getting button badges as well. 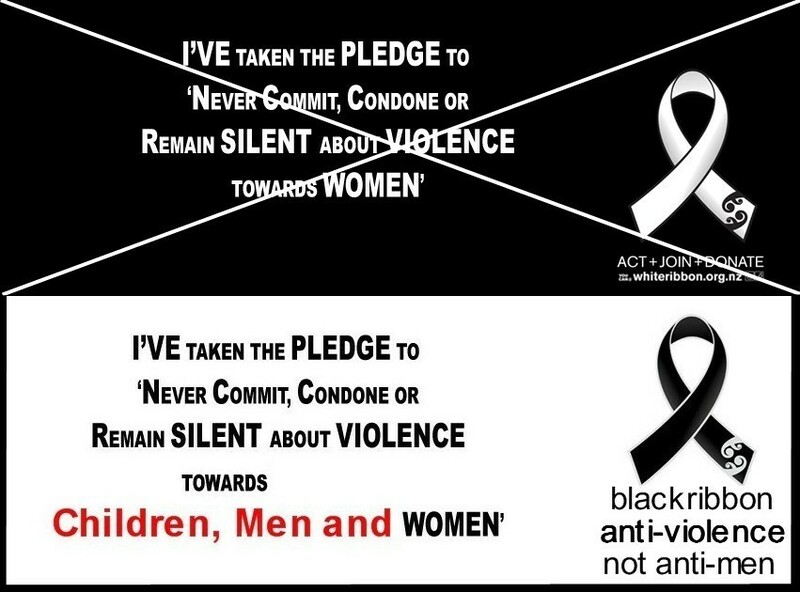 Unfortunately, we are likely always to be working on a shoestring compared with the White Ribbon Day sexism perpetrated by the Families Commission with about $50G from the government and all government departments urged to display their anti-male hate posters. The Black Ribbon Campaign may well turn out to be as spectactularly thinly supported as the opening of the Ministry of Men’s Affairs was (though we deeply thank those few who did turn up in support). 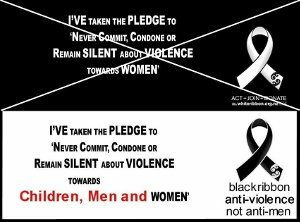 That is, unless people get behind it and spread the Black Ribbon Campaign around their own communities. Congratulations Hans and others who got The Men’s Ministry started at parliament’s grounds. Don’t despair about the lack of apparent support. Most Kiwi men I’ve ever met appear to have been brainwashed from an early age into viewing themselves as ‘rugged’ individuals. Sadly I see such ‘ruggedness’ as a brittle shell, emotionally shut down with little substance inside – machismo to the fore you might say. It’s what I’d expect in a relatively young pioneering culture. Only a few of the more emotionally intelligent men I’ve met had the nous to admit their vulnerabilities in private, let alone in public. So hang in there. You’re asking a hell of a lot, but from small acorns do mighty Oak Trees eventually grow. I wouldn’t worry too much about NZ media apathy either – not a lot of maturity there. Besides which the mainstream media is inexorably being supplanted by the internet in places where the internet is faster than currently the case in NZ. So that will be where NZ heads too as broadband speeds increase, data capping ends and smartphone usage increases. There’s a whole growing world of news being shared direct person to person by social networking sites which sidestep mainstream media filtering. Speaking of which Does the Ministry of Men’s Affairs have a Facebook Page? If not, then I thoroughly recommend it as a way to connect with sympathizers rapidly and in numbers. Hans, congratulation on making a start – sorry I was not there in support. This is the very concern we all have – the issues you mention in your summary are targeted at INDIVIDUALS – that is why the system gets away with it – INDIVIDUALLY we are fragmented and all suffering in different ways – just trying to live, paying excessive child support, lawyers bills just to see your kids, we are completely and totally oppressed by this system. That is exactly why you have so few numbers and that is why public displays of our concerns will ever work or get the numbers. Time is hard to make when are forced into the current system. May I suggest you look to take this to social media by way of a web site – for FATHERS, targeting specifically the family court, child support, and this so called JUSTICE system – set this web site up to accept brief summaries of each FATHERS concerns and how he has been Oppressed, prejudiced, Discriminated against – once you have a collection of specific cases – and agreement by those who submit them to give evidence in any proceeding – then hire the bests human rights lawyers the group can muster and take a charge to the courts – seeking damages. That is the ONLY way to wake up this system and highlight the concerns of individuals – PRESENTED COLLECTIVELY and with a COST in damages. Then you will see some action and acknowledgement of all the concerns we all express here. If such a case was won – and I believe it would be – because the concerns are real – then legislation would have to result – directly preventing discrimination on such matters – currently there is NOTHING stopping the systems servants from behaving this way -and so they get away with it. And we all pay dearly as a result. I really cannot see any other way to get some change in a FATHERS FAVOUR. I sense your frustration Hans but men in New Zealand do not deserve what they get. There was a time, I would not have believed the stories, I can now tell. There is a culture shock, a shift in reality, an upheaval of our values and belief system – to come to terms with what really does happen – when a man (the isolated male) comes face to face with our government-feminist machine. The difficulty always has existed in men’s activism, where the divide between those who have suffered experiences of injustice and corruption and those who have not, is so great that these two groups of men seldom co-operate. Those men that do turn up to these events, you might say are the ones that escaped from the hospital tent and crawled back to the front line. Physically and emotional drained and often living live under extremely stressful situations, as I am sure you are aware. As small as that number might be, we have to commend each and every one of them for not joining the suicide ranks. As small as that number might be we have to ensure that the public sees not just those few people standing there but the hundreds of black crosses, which accumulate behind you each year. I would draw a comparison of a few weary shoulders struggling home after their battalion has been slaughtered on the battle field – those bedraggled weary war heroes. Home here in sweet old gods own the public cannot perceive that a war zone exists in our own back yard and the public and media do not have the same heroic perception of a few men standing in front of parliament – as they would of a few soldiers limping home from war. There is not a lot difference between men who wear the emotional scars of war and men who wear the emotional scars of life in what some people describe as this feminist hellhole of New Zealand. This is meant to be peace time, so men don’t deserve what they get, simply because state soldiers can freely engage in civil terrorism, proper gander, injustice and corruption leading to unwarranted death and injury. I applaud your efforts Hans but I can’t accept your condemnation of men on the basis of a poor turnout – life for men in New Zealand needs to be understood and explained and I am sure your Black Ribbon pamphlet will be carefully crafted in that direction. I’m sorry to hear you sounding so disheartened about the turnout for your protest Hans. I couldn’t help noticing the TV coverage of thousands marching in support of gay marriage, around the same time. I realised a decade ago, after personally attending dozens of Family Court protests (including some in Wellington) that we are never going to be a mass movement. I’ve seen hundreds of men willing to die on the revolutionary barricades when they are fighting for their kids, but eventually the wounds scab over and they just want to get on with their lives. I believe that as a species, we are hardwired to consider men expendable, and this has been successfully exploited by radical feminist activists bent on achieving power and control over men. The anti-male White Ribbon hate campaign is an important part of this. Good on all of you who do attend protests, write submissions, and lobby those in power. I suggest it might be psychologically healthier to consider men’s activism a water dripping on stone exercise. It will take a suicidal man to wake society up. Not just the killing of himself nor a judge but a judges children. This might convey the pain that he felt upon the discovery that he no longer was to be a father but a distant uncle with all the financial responsibilities of a father. Desperate men do desperate things. When did the ex Israeli prime minister Menachem Begin change, from a terrorist and murderer of British soldiers, to become a respectable figure? When politics changed the morality of the Western mind is the answer. Violence is not a solution that I want any part of. 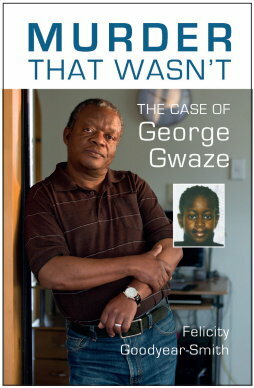 I am well aware that many NZ men fantasize about killing judges who have acted abusively, but if you really think that targeting their children would be likely to sway public opinion, then you have a psychological problem and I strongly encourage you to seek professional help, or at least talk about it to a friend as soon as possible. Please note how this worked out for Anders Breivik; I suspect you would not be treated so leniently here in NZ. You are correct that the difference between a “freedom fighter” and a “terrorist” is largely a matter of which side wins, but I don’t believe killing foreign soldiers who have invaded your country is an any way comparable to murdering innocent civilians. Any man advocating this sort of behavior is certainly not fit to be caring for his own kids, in my opinion. Of course publicly advocating the killing of innocent children on a site like MENZ is also the sort of tactic that radical feminists (who are unable grasp the concept of an uncensored forum) regularly use in an effort to discredit this site by making us look like a bunch of nutters. I suggest sir (or ma’am), that you are a troll. That’s a fine stance to take but you need to be aware that suicide is extream violence directed at ones self. It serves no purpose other than to end ones own misery and place it on others. If the scenerio i presented is horrendous to you then you are probably of a sound mind. When a man is suicidal he is not. I presented to you a possibility of what COULD HAPPEN if things continue the way they are. OK Kamikaze, perhaps you are for real. I know many men commit suicide in these circumstances (I’ve met several), and I have counseled hundreds who, under extreme stress, are clearly not of sound mind. It is likely that some of them will visit MENZ. That’s why it is important that we all be clear that there is a clear line between fantasizing about violence (which is a normal male response), and planning, acting or in any way encouraging others. I reckon I’ve played a part in reducing the danger of retribution that many NZ Judges regularly place themselves in, and hope most of you would do the same. If the California experience is anything to go by it is yet to happen here. It took a while for those fathers to reach old age but when their lives were done, they hadn’t forgotten what happened to them and their children. Eleven judges in total they shot but it did encourage some reforms around family law in that jurisdiction. I congratulate those making the effort to highlight the terrible state of NZ’s family law. But if we look to Australia, UK and many states of the USA, they have shared parenting already. So what is it we are doing wrong that NZ is so far behind (I include myself in this criticism)? I remember being called to a special meeting one day where I was told I would get custody of my children if I stopped participating in the Father’s movement – obviously I didn’t get custody of my children. I’m not the only one; of course there is that raving lunatic in Wellington that smashes footpaths in Courtney place. A judge looked Ben Easton in the eyes one day and asked him if he really wanted to place his children on the altar of his principles. Then there were those well heeled guys who suddenly disappeared and got on with their lives. It is not that we did anything wrong Bruce, you just have to understand the game these people actually play. Hi. I passed by your event – there were only two people there. I had to rush but I am sympathetic and was unaware there was a mens affairs community… which is why I am looking it up now that I am home. I wish you all the best. 1997 to 2017 that’s 20 years of active resistance. At least I can say I was a pawn on the board, they’ve tried hard enough to wipe me off. Perhaps after all this time, I could even say; a man with a chained-male suit, with a missing link. When the dirty politics goes past politicians and reaches out into the community, that is something very different to responsible government – The Feminastic Order. Coming from someone inside the bouncy castle, one has to consider the possibility, she may be right.